Your home's comfort and energy efficiency weakens when you don't have the proper attic insulation and air sealing. Attic insulation that doesn't meet current industry standards could feel like you don't have any insulation at all, with high heating and cooling costs, uncomfortable living areas, and irregular temperatures throughout. Contact Southeast Foundation & Crawl Space Repair, we specialize in attic solutions in Fayetteville, Wilmington, Greenville and the surrounding areas. With backing from the national Attic Systems network, we promise superior attic insulation and air sealing services that are guaranteed to make your home more comfortable, perform better and become more energy efficient. Lower your energy bills and maximize your home's potential — call us at 1-833-843-7430 or online by clicking below. We offer free, no-pressure price quotes in the Greater Fayetteville, Wilmington, Greenville region in North Carolina. 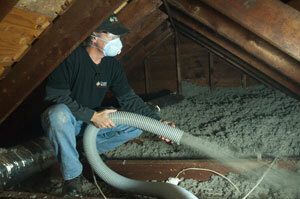 Cellulose insulation is the ideal way to upgrade attic insulation and improve R-value. Click to enlarge the diagram and see how we provide complete attic efficiency and comfort solutions. Uncomfortable temperatures: An under-insulated attic lacks the thermal barrier needed to separate your home and your attic. If your house feels too hot in the summer and too cold in the winter, then consider the attic solutions from Southeast Foundation & Crawl Space Repair. Blown cellulose insulation that meets recommended insulation standards will prevent air flow between the attic and the rest of your home, ensuring you are only paying to heat or cool your home. Costly HVAC bills: If your home's insulation is weak then it can be forcing your HVAC system to run longer than needed in order to regulate your home's temperature. An HVAC system that is constantly running will drive up your energy bills. By installing insulation that meets industry standards, you are ensuring that you will only have to use your furnace or air conditioner just enough. Uneven heating and cooling: Are the temperatures in your home irregular? One or two rooms that are always a little too hot or too cold in the summer and winter months? Insufficient attic insulation and poor air sealing is usually the culprit. If your attic is leaking air, then the rooms surrounding it will be directly impacted and will go on to affect the rest of your home. Consistent air sealing and attic insulation throughout your attic will help combat fluctuating temperatures. Noticeably weak insulation: Can you tell if your insulation isn't cutting it? Attic insulation that looks weakened and depleted probably is not doing enough for your home's comfort level and energy efficiency. The U.S. Department of Energy recommends homes have 13-18 inches of insulation, depending on the local climate. According to the Insulation Institute, 90% of U.S. homes don't have industry standard insulation, so there is a good chance you don't either. Tired of expensive energy bills and fluctuating temperatures in the living areas of your Greater Fayetteville, Wilmington, Greenville, NC home? Southeast Foundation & Crawl Space Repair will provide high-quality Attic Systems attic insulation solutions that will reduce your heating and cooling costs as well as enhance your home's comfort throughout the seasons. Check out our blown cellulose insulation, air sealing and other services. We service Fayetteville, Wilmington, Greenville, Jacksonville, Goldsboro, New Bern, Sanford, Wrightsville Beach, Camp Lejeune, Lumberton and the surrounding areas and offer free estimates on all our attic solutions, so call us today at 1-833-843-7430 or click below to get yours!